As Syria enters a sixth year of devastating conflict, a generation of youth is reaching adulthood having spent their formative years in limbo, according to the global organization Mercy Corps. Nearly one in four of the 2.4 million Syrian refugees under the age of 18 is a teenager, and the multi-billion-dollar aid effort has largely overlooked this demographic. Mercy Corps is calling for major new investments in Syrian and other marginalized youth, whose decisions will shape a trajectory of either peace or continuing instability in the Middle East. Syrian adolescents face serious challenges around well-being, education and employment. Five years of prolonged stress have affected the development of their brains. Fifteen years of progress in education has been lost, with an estimated 700,000 Syrian refugee youth out of school. And there are countless barriers to safe and fairly compensated work. 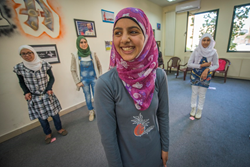 “Teenagers are so overlooked that we can’t even say with certainty how many Syrian refugees are between 12- and 19-years old, or how much of the aid budget is spent on them,” says Neal Keny-Guyer, Chief Executive Officer of Mercy Corps. Investments in stronger informal education can put young people back on track to re-enter formal education or prepare them for the job market with relevant professional skills. For example, Mercy Corps is modeling a new approach to informal education in southern Turkey, blending face-to-face instruction with digital education, as well as linking youth with local businesses and potential employers.